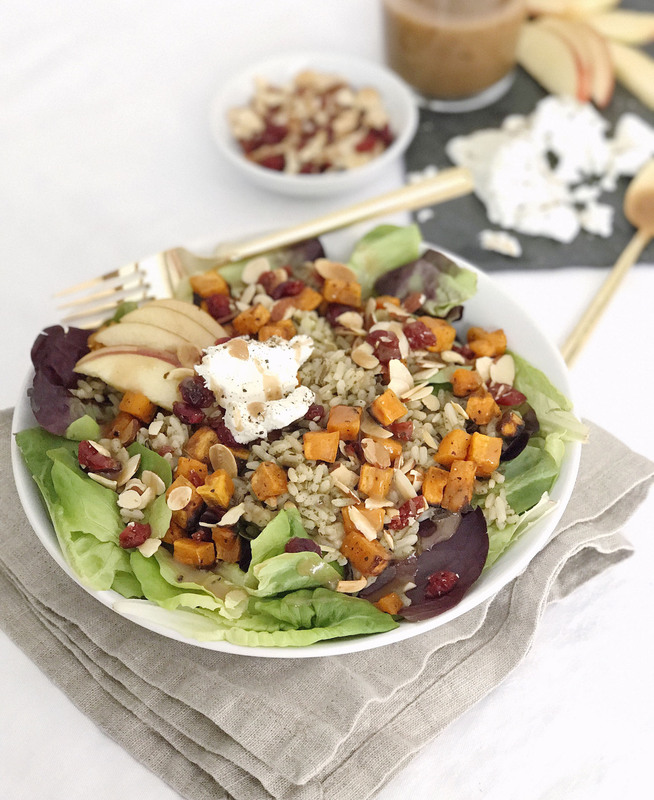 Wild Rice Winter Harvest Salad. Post-baby we have been so lucky to have friends and family dropping by with sweet treats and delicious, hearty freezer meals. Though, after almost a month of eating homemade cookies and cheesy baked pastas like it was our job, the indulgent eating is starting to catch up to us and I’m realizing we need to get back onto a healthy kick. 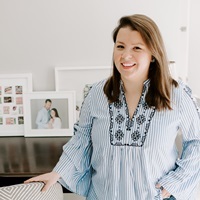 One of the best ways for us to get into a healthier routine is to plan out our meals ahead and have everything prepped in the fridge — otherwise I grab whatever snack is easy to pop-in my mouth with my free non-baby-holding hand! I decided to make some hearty winter-flavor inspired salads, with everything pre-portioned out for easy to grab lunches. This one was inspired by a few grain-bowl salads I’ve had at restaurants. 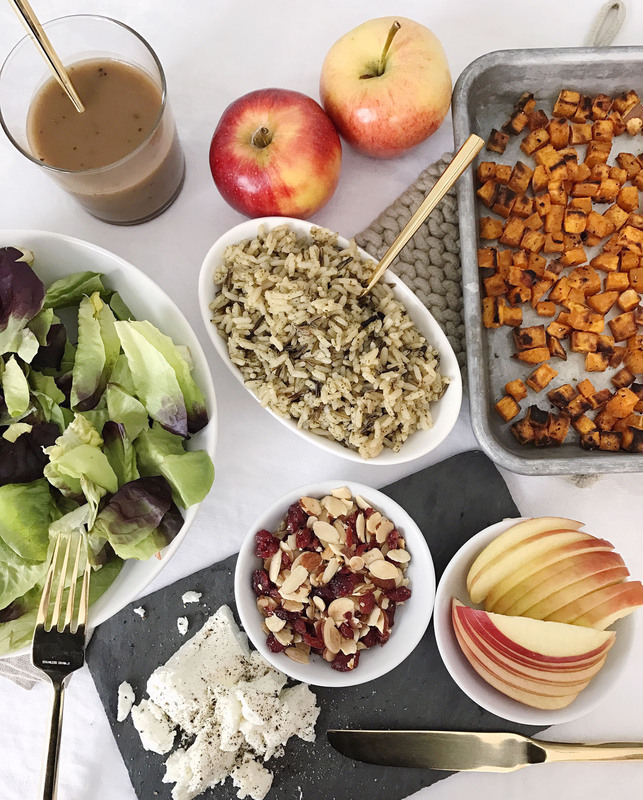 I topped it with tasty wild rice, roasted sweet potatoes, sliced apples, dried cranberries and sliced almonds. A little scoop of goat cheese, some fresh cracked black pepper and a simple balsamic vinaigrette finished it off for maximum flavor. 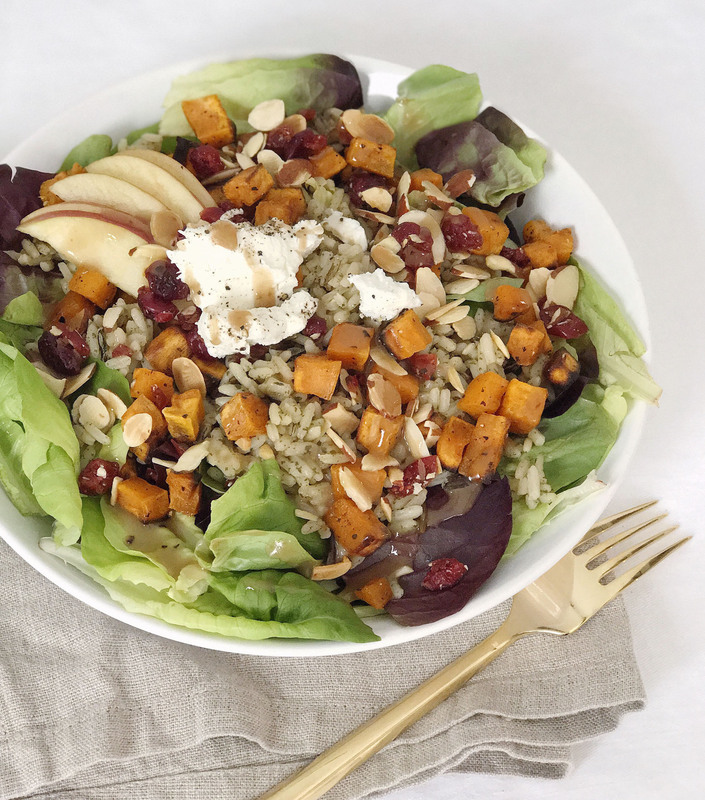 The rice and sweet potatoes give it a hearty feel, and the apples, cranberries, and balsamic give a sweet and tart flavor that makes it extra tasty. Grab the full recipe below! Divide a handful of mixed greens across four bowls. 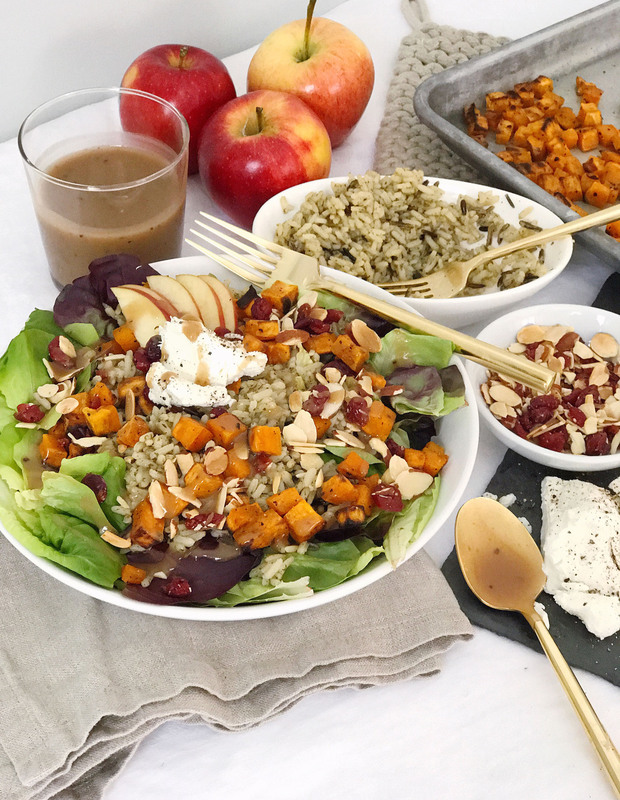 Top each bowl with a quarter of the wild rice, roasted sweet potatoes, sliced apples, chopped almonds, dried cranberries, and goat cheese. 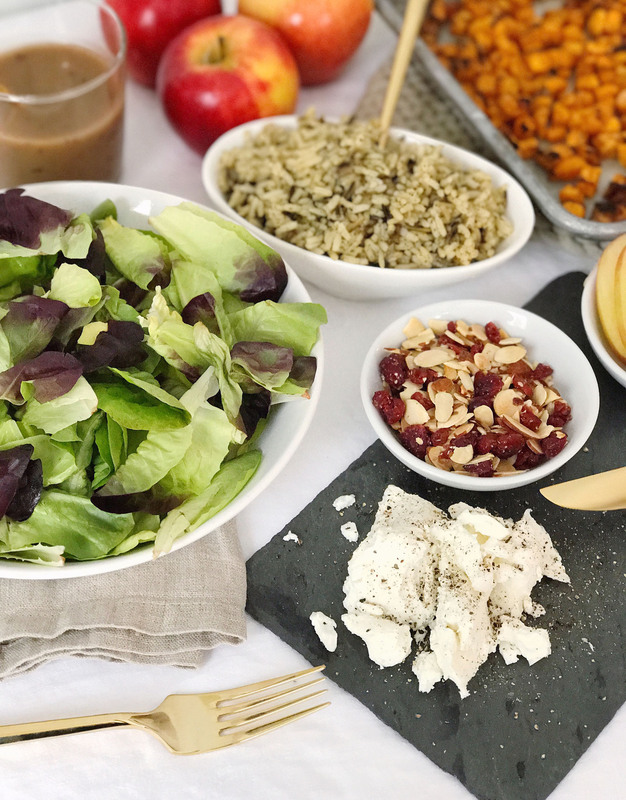 Finish each bowl with freshly cracked black pepper, and drizzle with balsamic vinaigrette to taste. Awards Show Party Bento Boxes. Awards Show Caramel Popcorn Sundaes. 2 Responses to "Wild Rice Winter Harvest Salad." 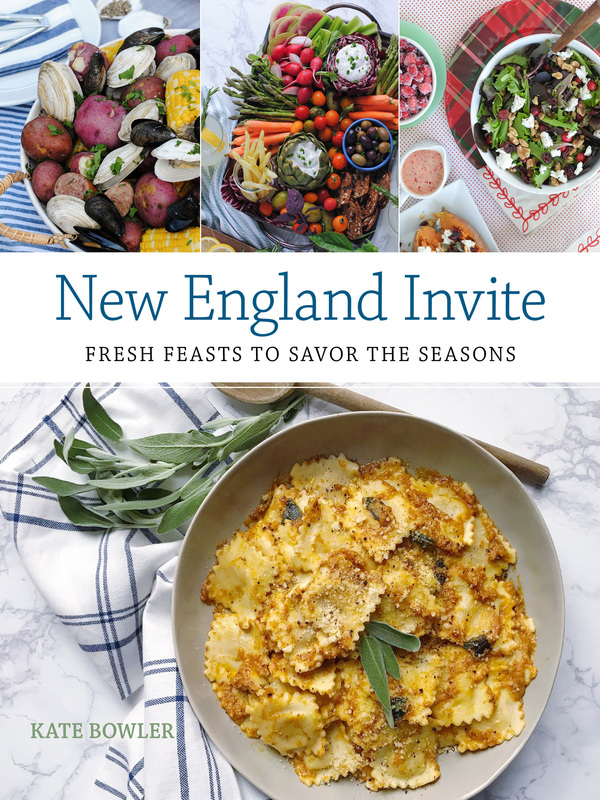 This harvest salad sounds amazing! I’m traveling for work this week, but am going to make it for lunch at work next week!